Congrats, you did it! Now that you’re married and all settled in, it’s time to get decorating. 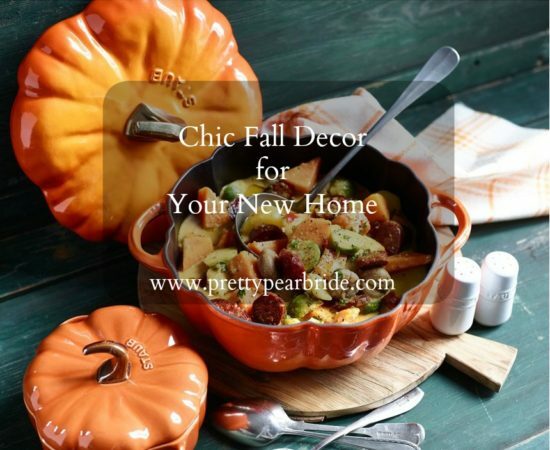 What better time of year to decorate your home than fall. We compiled some cute ways to spruce up your home in October and November. Entertain friends and family with this adorable pumpkin-shaped cast-iron cocotte. We just adore the color and size and of course the festiveness of it all. It’s the perfect size to make a stuffed pumpkin recipe in. Stick some faux fall flowers in these babies and they’ll get you through Halloween, Thanksgiving and beyond. 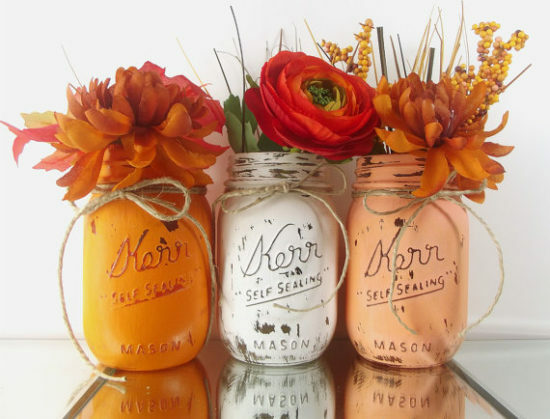 We love the colors they’re painted in and the rustic twine just adds a certain autumnal touch. Pillows add such a cozy, homey touch and add something fall-themed on them? Well, you’ve got a winner. 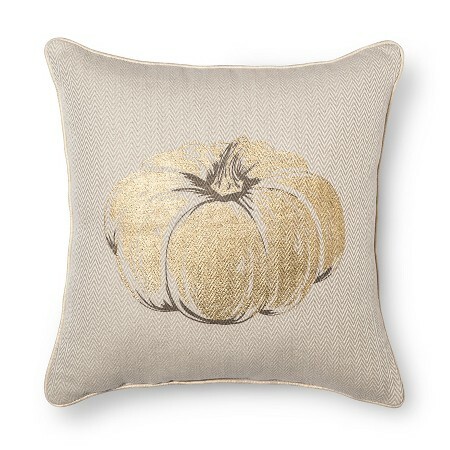 This Target pillow with a gold pumpkin on the front is great quality and is timeless and classy. Not to mention, at only $19.99 it’s a steal! The hydrangeas are so brilliant and vibrant on this wreath that they just seem to pop in front of your eyes. 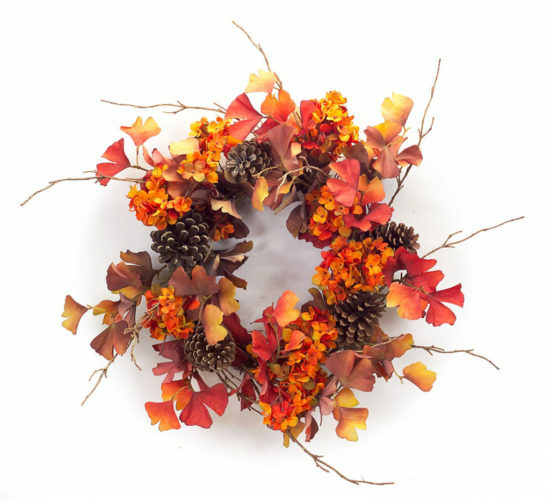 Paired with fall foliage, leaves and pinecones it makes for a truly beautiful wreath. We can already see it centered perfectly on your front door. Gorgeous! Celebrate your new last name (if you changed it!) 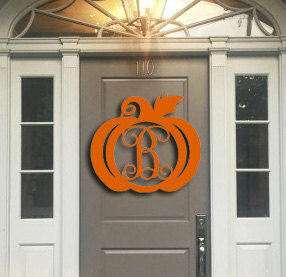 with this monogrammed pumpkin door hanger. The hanger is handmade and we just love how fun yet chic it is. The sign comes in two different sizes, 20″ and 26″ wide. The sign comes unpainted, but the seller can paint it for you at an additional fee. Go for the no paint option as a fun project with your new husband! What are some of your favorite fall decorations and where do you like to buy them? We want to know! Comment below with your suggestions. Kate is a wedding blogger, writing for blogs like The Big Fat Indian Wedding and formerly United With Love. Kate is a regular freelance writer for many other publications including Brides Magazine's digital department, the Washington Diplomat and a local DC yoga studio. As a plus-sized woman herself, Kate was eager to work for Shafonne and contribute to Pretty Pear Bride as she loves the message of self-confidence throughout the blog.